Only one more day until Valentine's Day!!! My cards are all done now and in the mail to those I love most. Today I am using the brand new Geo Thanks stamp set from Gina K. Designs. This set was designed by the very talented Claire Brennan. 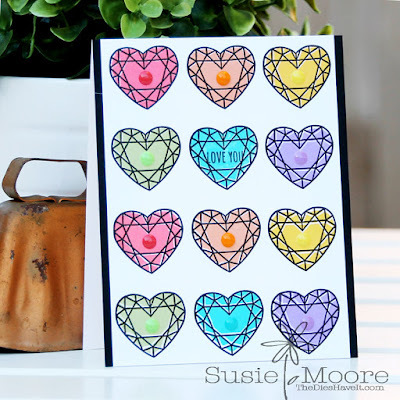 I stamped my images in a grid pattern and then colored them in using six Copic markers. I didn't do any shading at all which made this a quick card. To finish my creation I added coordinating enamel dots to each heart. I hope you have a terrific day and I'll see you again tomorrow!